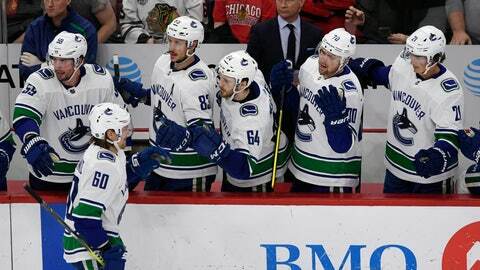 Horvat scored 16 seconds into overtime, and the Canucks stopped Chicago’s five-game win streak with a 3-2 victory over the Blackhawks on Monday night. “That was a hell of an effort by our whole group tonight,” coach Travis Green said. “Getting these wins have been really good for our team,” Horvat said. The Blackhawks trailed 2-1 before Gustafsson’s long slap shot went off Edler in front and past Demko with 3:13 left in regulation. But Horvat stepped up in overtime, finishing a give-and-go with Edler for his 25th of the season. Elias Pettersson picked up an assist on Granlund’s 10th goal for his 61st point, snapping a tie with Pavel Bure and Ivan Hlinka for the franchise rookie record. Pettersson was selected by Vancouver with the fifth-overall pick when the draft was held in Chicago in 2017. NOTES: Blackhawks F Drake Caggiula missed his eighth consecutive game after he sustained a concussion against Anaheim on Feb. 27. “He’s in the protocol,” coach Jeremy Colliton said, “and certainly we’re not in the area that we’re worried about him being done for the season.” … The Canucks improved to 10-9-1 in back-to-backs this season. … Former Chicago White Sox slugger Jim Thome was honored after he was inducted into the Baseball Hall of Fame last summer. Thome got a big ovation when he went out to center ice for a ceremonial puck drop. The Blackhawks also observed a moment of silence for Thome’s father, Chuck, who died last weekend.